This photograph was taken in 1906 by William Shuttlewood. William Shuttlewood lived in Quorn with his wife and three children for a relatively short period -from about 1905 to about 1909. However he obviously enjoyed photography and Quorn owes him a great debt for the wonderful pictures he took at this time. Many examples of his work can be found in the collection and his full story is told elsewhere on this site. 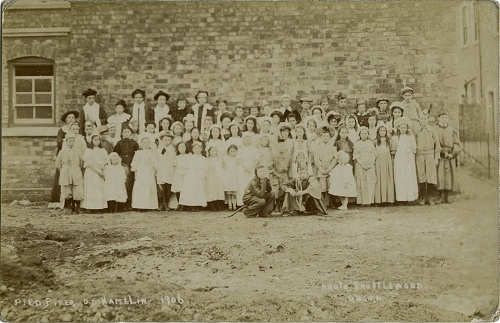 This particular postcard shows a group of children and young people who have taken part in The Pied Piper of Hamlin. So far it has not been possible to identify the building that they are standing in front of. It may have been demolished. Missing information: Can you identify the Quorn location where this postcard photograph was taken?